This squarish canvas, formally a lotus medallion containing the face of goddess Kali enshrining a ‘ling’ form, obviously the Shiva-ling, with rest of the canvas-space covered by a lot of inverted and upright triangles – intricate or otherwise, squares, circles, bands of flowers and stylised creepers and other design-patterns – mostly geometrical, represents symbolically the union of Shiva-Shakti and the emergence of Creation : space – defined and undefined, cosmic sound – from unruly noises to the ‘ruled’ and systematised sounds, and time – the days and the nights, as also the ‘chit’ – cosmic Mind, and ‘Prakriti’ – matter. 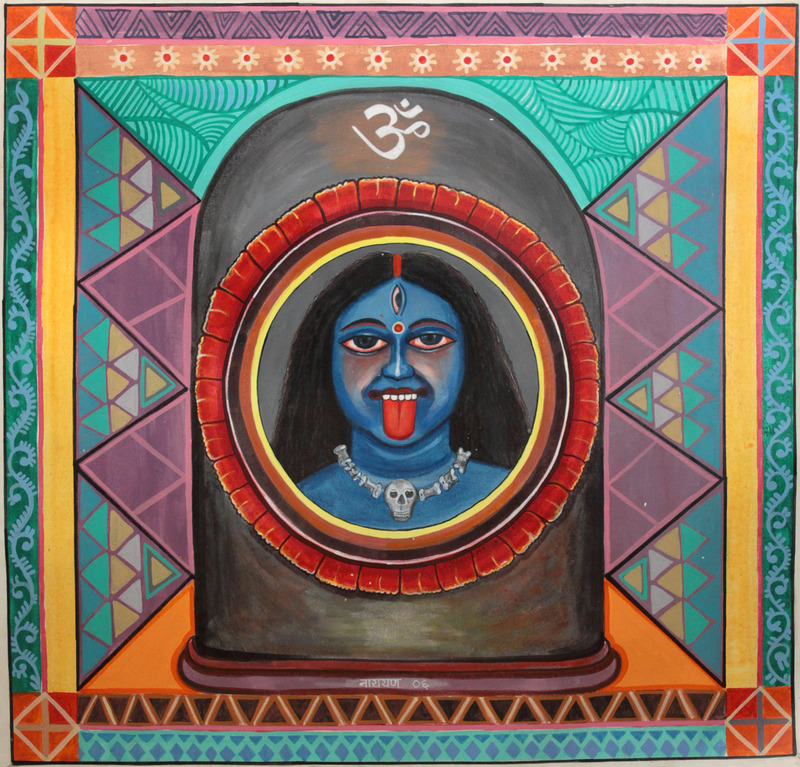 The painting seems to represent a ‘mukha-ling’, that is, a ‘ling’ with a ‘mukha’ – face, though unlike the ‘mukha-ling’ iconography in which both, ‘ling’ and ‘mukha’ belong to Shiva, here in this image only ‘ling’ is Shiva’s, but ‘mukha’ is Kali’s. The ‘mukha-ling’ iconography suggests merely that Shiva in his symbolic ‘ling’ form is the same as in his anthropomorphic form. 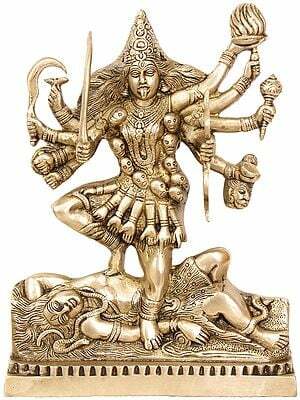 This form of ‘ling’ with Kali’s face merged with it as just its aspect is widely different from the ‘mukha-ling’ icon. Except that her face, not ‘yoni’ – her usual form in Shiva-ling icons, has been used to represent her this representation denotes the union of two : Shiva and Shakti. As Shiva in his anthropomorphic form and ‘ling’ form is the same, Kali is also both, phenomenal and epiphenomenal. In one way she is the Shiva’s power to create and dissolve, in the other, his companion. During dissolution all forms merge into her and during creation all forms emerge out of her, and in that case the Darkest One, Kali, is the formless colourless all-pervading void. This is broadly the Tantrika vision of the Creation. A Tantrika considers Creation as the outcome of the union of Shiva and Shakti – Shiva as ‘ling’ and Shakti as ‘chit’ – cosmic Mind, though while in the Tantrika way ascendance to ‘chit’ : the apex, is begun with ‘yoni’ which constitutes ‘Muladhara’ – the basis in Tantra-sadhana – Tantrika practices, this art-piece conceives the goddess as the face where the Mind or ‘chit’ enshrines, obviously the ultimate of the journey that take off from ‘yoni’. Whether as ‘chit’ or as ‘yoni’ by her union with Shiva, who is the cosmic ‘ling’, Shakti overwhelms him with the desire to create and the two conjointly effect Creation. A medallion consisting of concentric circles, outer-most being a broader one comprising lotuses, constitutes the centre of the painting. 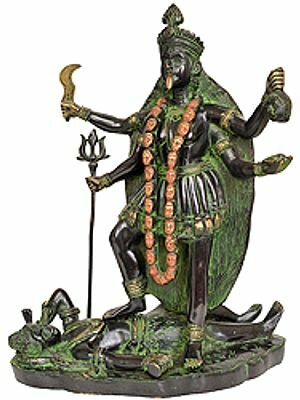 The medallion enshrines a form of blue complexioned Kali who except for her lolling tongue and a necklace of human bones and skull is in her sublime creative aspect known in Kali’s iconography as her Bhadrakali form. A round face with pearls-like teeth, eyes hued in red, not denoting ferocity but amour, radiant face, beautifully laid hair and well defined features, besides the vermillion mark on hair-parting, all suggest that possessed with the desire to create she has completely submitted her to Shiva and her union with him is absolute. Now the process of Creation has begun. The first circle, pale yellow, around her represents formless void. From it radiate two circles representing light and darkness, and correspondingly, the day and the night. And, finally, there is the lotus-ring representing three cosmic zones : the earth, the sky and ocean which lotus singly symbolises. On the top of the ‘ling’ icon is inscribed the sacred syllable AUM : condensation of all noises and all sounds. The rest of the space is covered mainly with inverted and upright triangles, the inverted symbolising ‘yoni’, and upright, ‘ling’, and their interaction, coition and creation. Squares, in which form the two triangles inseparably join, also denote multiplication of Shiva-Shakti union, and thus the incessancy of the act of creation – a reflection of Shiva’s desire ‘Ekoham bahushyami’ – I am One but wish to multiply: the Shaivite doctrine to which Tantrikas show greater adherence.